BENGALURU: With just a few days left for Ramanavami (April 14), people at the Srirama Seva Mandali, Rajajinagar, are a busy lot. 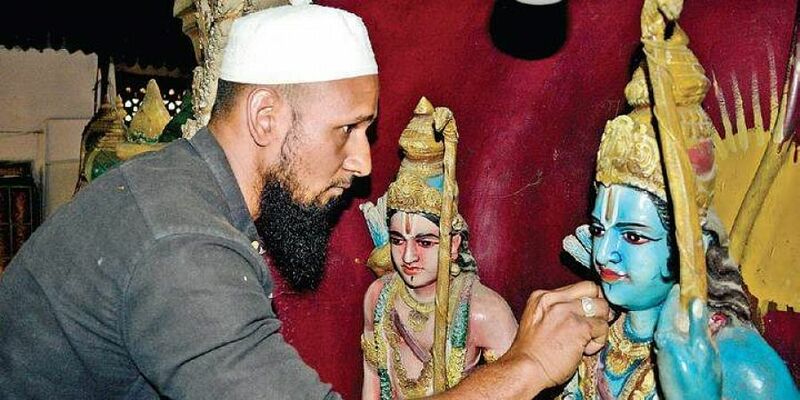 With the temple chariot taken out annually for a rally across Rajajinagar, keeping it serviced and maintained is the job of a quiet and unassuming twenty-seven-year-old man. Saddam does not wait for anyone, enters the temple premises and starts working. He takes a ladder, climbs up till the roof, dusts and wipes, sweeps and cleans -- he does all that alone. Good on you mr Hussain.you are great. Thanks a lot Saddam Hussain for doing such a holy job keeping alive harmony in the society over and above religious compulsion. A lesson for fake worshippers. Thaks for sharing such a good news. I am happy.